The Double breasted suit first came on the fashion scene in the mid 1930s and stayed popular until the 1950s. There was a certain defining difference and attitude about the way that these types of suits differed from your standard single breasted model with the way it wraps over. A certain uniqueness that beckons others to gaze upon you and notice that you actually understand what style is aren't afraid to show it. You can go to any wedding party or special event that calls for suits and notice that one individual man who is wearing a double breasted jacket suit while everyone else is conforming and afraid and are wearing single breasted suits or Mens Blazers for that matter. That man has confidence in who he is and doesn't feel the need for conformity and group approval. You'll be inclined to secretly want to know who this man is and what he does for a living. That is the power of wrap front style suits. This type of suit is nothing like Linen Suits. Whenever I see someone wearing a double breasted suit I immediately think "world traveled". Have you seen our Great Selection of Crocodile Shoes Here. If you also need to shop online for Wool Overcoats, here is the page you need to click on. 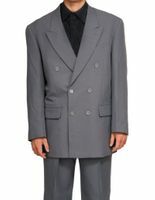 If you're a wardrobe manager and need to obtain an authentic looking gangster costume for your wardrobe, a double breasted suit in a pinstripe or bold stripe is always a good way to go. Shop more Cheap Suits that have a great fit and are made well here. 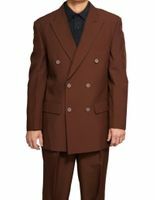 Do yourself and your wardrobe a big favor and add some nice double breasted suits to your wardrobe made of fine wool feel gabardine fabric by Vinci. These double breasted style suits are the cornerstone of any well dressed man's collection. This black double breasted suit features a muted thick and thin stripe fabric that will give you that double breasted suit look you crave. 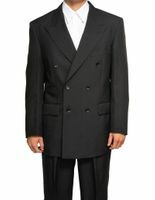 The double-breasted suit features a jacket that has overlapping front flaps which has on its front two symmetrical columns of buttons; by contrast, a single-breasted item has a narrow overlap and only one column of buttons. In most modern double breasted style suits, one column of buttons is decorative, while the other is functional allowing the wearer to close the jacket properly. The other column of buttons, placed on the outside edge of the suit jacket, allow the overlap to fasten reversibly, right lapel over left lapel. To strengthen the fastening, a functional inner-button, called the jigger which is an anchor button, that is always added to fasten the over-lapped layers together from the inside. The jigger button keeps the jacket in a symmetrical fashion allowing the front of the jacket to lay properly for the perfect look. Most double double breasted suits and blazers primarily have 1 to 4 rows of buttons (each row containing two buttons) for each flap of the front of the jacket, 1 or 2 of the rows being functional for fastening the jacket. Each fastening method is identified using "number-on-number" terminology; the first number will be the total number of front buttons on the jacket, while the second is the number of fastening buttons below the lapels (i.e. the second number also is the number of corresponding buttonholes). 6-on-2 and 6-on-1 happen to be the common button style, but others styles exist. Style wise, these suit jackets usually have peaked lapels, and fasten left lapel over right lapel as usual for men's jackets. You'll notice that every single one of the suits in this category button the same exact way. Double Breasted Suits These Days Have 6 Button Jackets. These days you will find that most double breasted suits and jacket use the 6 on 2 style front which is the classic and original style for these stylish suit. In the 1980s, a double breasted style suit had a completely different silhouette due to the use of shoulder padding which gave the jacket a much more baggy look and attitude. You would find that the jackets of that era had a closed back on the bottom. In other words, there were no side vents due to the baggy nature of the jacket. You would also find that the jacket used a 6 on 1 style which means that only the bottom side button would be used to close the jacket. The lapels would be a bit larger to accommodate the extra wide shoulders on the jacket. It is a completely different look from the 6 on 2 version and only takes a glance at any movie from that era to notice how dated that particular style looked. Always Leave the Bottom Button Open. In this era, you just won't find that look anymore. You are going to find that most if not all double breasted suits come with the 6 on 1 style which has a look that doesn't go out of style since it's the original design. The jacket is more properly tailored for a better fit and look compared to the sloppy baggy look of the 1980s style double breasted suit. When you wear the modern version, you need to know that you should never button the last button. Although you have two buttons to fasten, you always leave the bottom button UN-fastened. That goes for any type of suit really. It is for allowing proper movement of the jacket. The double breasted jacket should be buttoned while standing. Another big faux pas is to never and I mean never wear a double breasted suit jacket open when you are standing up and walking. If you need to open the buttons on the jacket while sitting, the moment you get up, it is imperative to properly button your jacket. Otherwise you will look simply horrible in your suit. While you can wear a single breasted style jacket open while standing up. I don't really recommend the look, on a double breasted suit. You will look completely UN-done and really look like you need to button your jacket. The double breasted suit is a special type of suit and needs to worn buttoned up. You would never see Prince Charles wearing his double breasted suit not buttoned up. Those columns of buttons make a statement. 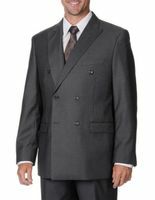 While the original double-breasted suit jacket has 6 buttons, with 3 to close the front. This style originated from the naval reefer jacket. Think of the stylish Pea coat. Because short men may find that 6 buttons doesn't look right for their shorter body, a 4 or 6 button format in which only the bottom one closes may be a better option. The 4 button style jacket that buttons at the lower button is often called the "Kent", after the man who made it popular�the Duke of Kent. As stated, most modern double breasted suit jackets do not button this way at all. Double-breasted suits were extremely popular from the mid 1930s until the late 1950s, and came back in style again from the mid-1980s to the early 2000s. 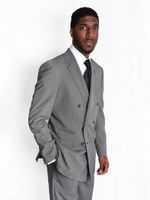 Today, double-breasted suits are not as popular in the USA except in fashion minded suit stores, and it is difficult to find them at many mainstream suit stores; however, they continue to be popular in England, and in America are produced for and made by the high-end menswear lines of Joseph Aboud and Ralph Lauren who is often seen wearing one. They are also found in the modern slim fit suit that young men these days are wearing quite a bit. Thinner Men Look Great in a Double Breasted Suit. I will be the first to tell you that not all men can properly pull off a double breasted suit. You need to have a certain body type that is slimmer in proportion than not. A stocky man usually doesn't look so good in a double breasted style suit. If you are of moderate height but thin, a double breasted type suit will look stellar on you. 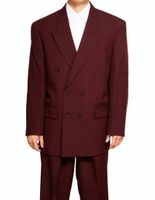 If you are a tall man with a decent physique, you too will also do the suit justice. Overweight men who need to wear a suit, should really not consider the double breasted style unless they have the height to pull it off properly. The double breasted suit has always been a regal style suit since it's inception. When you decide that you want to be that man who wears one, you are actually making a decision that is certainly going to impact how you carry yourself and how you look. The double breasted suit is completely unlike wearing your basic single breasted suit. When you see other men wearing them, you are seeing a man who has complete confidence in himself and isn't afraid to show it. Isn't that what being a man is all about. When shopping for a double breasted suit, fabric and construction should always be a consideration. While not everyone likes wearing suits made of wool, the suit you choose should at least be super 150s poly/rayon or poly/viscose which is another name for the same type of fabric. You want your double breasted suit to be made of better fabric so it drapes better on you, wrinkles less and stays fresh looking the whole time you're wearing your suit. When better fabrics are used to make a suit, they usually use better suit construction as well. The jacket itself will be better made with a better chest piece which gives the front of the jacket it's structure and shape and allows the wearer of the suit jacket to move properly compared to a cheap suit that is made of inferior materials. The slacks will also have a better waistband on it which also has structure added so the waistband doesn't roll over on you while you're wearing it. Men with a belly know what I'm talking about here. Unless you are just wearing the suit a couple times, I would stay away from a full poly fabric double breasted suit because those are usually made for a price point to be as cheap as possible. 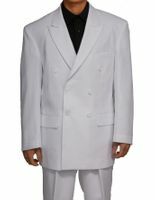 That means that manner corners in suit making have been cut in order to bring that suit down to a specific price level. You can wear these suits a couple times and maybe dry clean them once. After that, all the glue that was used in the making of the suit will start to dissolve and create puckering in front of the suit jacket where the chest piece was fused to the shell of the jacket. That is why I always say "Buy The Best Suit You Can Afford". You will get more use out of it and it will last longer and look better on you longer as well.